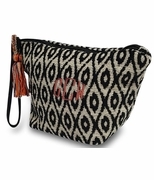 Chic and trendy jewelry or cosmetic style personalized bag. Quality construction and lined for small personal items in a soft oatmeal fabric with grosgrain ribbon trim. 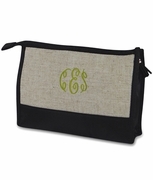 Great gift for bridesmaids, employees or special friend get-to-gathers. Includes single or three letter monogram. 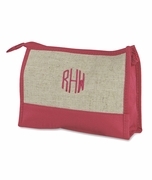 Personalized cosmetic bags for bridesmaid case measures 9� x 7� x 2" across the bottom. Zipper closure. This is the second time I have ordered from Simply Bags and I find that their products are high quality at a great price! The customer service is amazing as well! If they have any questions, they email you and ask instead of assuming. I will definitely order again!